Freud promised his patients absolute confidentiality, regardless of what they revealed, but privacy in psychotherapy began to erode a half-century ago. Psychotherapists now seem to serve as "double agents" with a dual and often conflicting allegiance to patient and society. Some therapists even go so far as to issue Miranda-type warnings, advising patients that what they say in therapy may be used against them. Confidentiality and Its Discontents explores the human stories arising from this loss of confidentiality in psychotherapy. Addressing different types of psychotherapy breaches, Mosher and Berman begin with the the story of novelist Philip Roth, who was horrified when he learned that his psychoanalyst had written a thinly veiled case study about him. Other breaches of privacy occur when the so-called duty to protect compels a therapist to break confidentiality by contacting the police. Every psychotherapist has heard about "Tarasoff," but few know the details of this story of fatal attraction. Nor are most readers familiar with the Jaffee case, which established psychotherapist-patient privilege in the federal courts. Similiarly, the story of Robert Bierenbaum, a New York surgeon who was brought to justice fifteen years after he brutally murdered his wife, reveals how privileged communication became established in a state court. Meanwhile, the story of New York Chief Judge Sol Wachtler, convicted of harassing a former lover and her daughter, shows how the fear of the loss of confidentiality may prevent a person from seeking treatment, with potentially disastrous results. 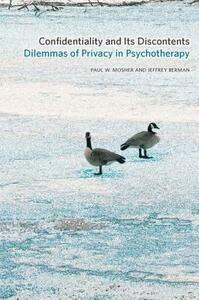 While affirming the importance of the psychotherapist-patient privilege, Confidentiality and Its Discontents focuses on both the inner and outer stories of the characters involved in noteworthy psychotherapy breaches and the ways in which psychiatry and the law can complement but sometimes clash with each other.